• existing old-style collections that have been migrated continue to work, however if they include sub-collections (which are not available in the new type of collection) you are effectively locked-out of being able to manage them. 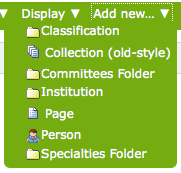 • You can use collections, for instance to create the a-z pages at http://www.hist.cam.ac.uk/directory/academic-staff . To create this you add a tag for every letter of the alphabet and associate the appropriate one with the profile of each member of the directory, then create a set of collections that list all the people with each letter, and pointing to these collections from the a-z strip at the top of each page. See Adding an a-z selector bar to a page, or on multiple linked collections for instructions.